Since starting FEH in July there are 2 OCs I've really liked, everyone knows I love Hríd but I never really mentioned the other one. Ever since the first book I've really enjoyed this character and even called them a butler at first (Thanks Xenologue 1 xD) then their identity was revealed and then didn't appear until he final chapter of book 2. 2pm hit and I knew it was time for the Spring trailer, I guessed Marth and Caeda through the silhouettes and wanted Ylgr, but didn't really want much since here was 3 spring units from previous years I wanted. I covered my mouth and screamed. Cause there on the thumbnail, was him. BRUNO! Bruno is finally home IN A BUNNY OUTFIT xD. I can now have both of my favourite OCs now! Oh and he's joined by his sister Pala and Marissa and Loki is a free TT unit. Soooo who's everyone going for? Okay this isn't a rant but I need to say my thoughts for the new chapter. I nearly cried when Henriette said Gustav was ill already, so he pretty much had cancer? And explaining the whole branch thing from 3 year old Alfonse was cute! But then came that scene from 5-5. Gustav, although under Hel's army now, can say what he wants, he just can't control his actions, hence why he battled the order. But then... the line that got me. "I love the both of you." You know who said that? Gustav. Yes. GUSTAV. He's not possessed or anything, this is the real actual father of Alfonse and Sharena from the star of book 3, and that was directed to both of them, HE FINALLY ACTUALLY ACKNOWLEDGED HIS DAUGHTERS EXISISTANCE! This makes me wonder now though... can Líf and Thrasir say what they want but don't have control? Oh buy if my prediction of the former Nifl queen becoming a member of Hel's army comes true I'm kimds glad Fjorm has sgill not appeared in the 5 chapters of book 3 so far! Also another thing I haven't mentoined despite it happening nearly 2 months ago now. Something that's either a mistake or change in the backstory of 2 fellow OCs. The official website now has a Meet Some of the Heroes section, that has bios for all of the legendary and mythic heroes, and all of the new heroes and seasonals released since February, however there's soemthing interesting to point out about 2 of our legendaries, who are they? None other then Gunnthrá and Hríd. The website states that Hríd is older then Gunnthrá, even though Fjorm stated in game that its the other way around....???? I have no idea which ones is right. What doss everyone think? Ouch I guess this banner was not for either of us... however the smash trio are all red on April's banner! 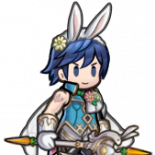 And Hríd is on May's with Eirika and surprisingly not on the same banner as Gunnthrá! Oh yeah what was everyone's free seasonals? I went green for the first one for either Chrom but got his sister and went on red for a certain someone praying to not get his sister like with Chrom and I got exactly who I wanted! With other recent banners, I got all the first 4 beasts (Reyson <3) and actually got Nailah in stead of Selkie and Kaden! Also Gustav is an enemy in the next chapter! GG Team Ylgr with the win! My team may have ended up in 4th but I'm now cheering her team to beat Fjorm in the finals! I found it hilarious that she defeated the only nice "mister monster guy" (doesn't call him that but wanted to reference the name xD) from Múspell then she defeated her brother. Also there is a Feh channel on Tuesday morning! (Monday for most people) and book 3 and 3.0 is confirmed to be coming afterwards too after a 5 hour maintence! Time to join the hype train! Also the Voting Gauntlet is very close! The battles between Surtr and Fjorm and Hríd and Laegjarn are so close none have a multiplier! Never thought of this until now but one of my friends mentioned that there is a major possibility that the Nifl siblings are Manakete's or half Manakete, like Ninian and Nils. They have mentioned being the "children of the ice dragon Nifl" but I thought that was some royalty thing. Their father is never mentioned, so it could be that the ice dragon Nifl is actually their father... Well guess we'll wait to see if we get alts of them which have them transform. Also the Voting Gauntlet starts tonight! Let's go team Hríd! Round 1 of the Voting Gauntlet is Fjorm vs Surtr, Gunnthrà vs Laevatein, Hríd vs Laegjarn and Ylgr vs Helbindi. If we're going by popularity I'm guessing finals will be Surtr vs Hríd, though it will be cool (or hot? Hehe) if it's a Nifl final of Múspell final. Sadly didn't have the best of luck with the Legendary Hero banner,with 300 orbs I got 4 Kana,and 1 Laevatein, Ryoma, Summer Innes, Gunnthrà and finally the most important, Hríd. The Forging Bonds event on the other hand I really liked it's a prelude to book 2 but we do learn a few new interesting facts about the siblings! Firstly they all have the dream ability Gunnthrà has, but Gunnthrà has more training and ability most likely because of age, although we do not know the age gap between Gunnthrà and Hríd, but Hríd almost seems to be a beginner like Fjorm. Also Gunnthrà uses the Rite of Dreams to talk to the Summoner and that's how she is able to talk to us through dreams in book 2. Another major thing is in the B scene. This scene is Fjorm and Hríd talking about the upcoming war and training but there was one thing revealed. 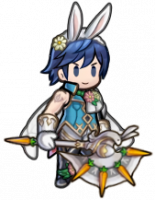 Hríd gave Fjorm Leiptr, after it had been sealed and not used for generations. Definitely an interesting little fact! Another thing from the scene makes the whole chapter 11 scene sadder though... Hríd says "If I fall in battle, make sure Mother and our sister's are safe." Before Fjorm immediately objects. Of course if you remember,in chapter 11,Hríd was on the verge of dying when we saved him and Fjorm was clearly very stressed but relieved her brother was alive. Also the Voting Gauntlet is confirmed to be Nifl vs Múspell. Come on Team Hríd! Finally, after several long and disapointing month's, our beloved Prince of Ice has arrived! Hríd is our legendary hero for November! So once again, my only targets of this banner are brother and sister. However knowing my luck, I'll get a million Ryoma and Laevatein but no Hríd. Actually Laevatein pity broke me on my free summon of the Vantage banner xD so the game was trying to tell me to Dave my orbs instead of trying for Ylgr and Surtr! Okay I'm having 0 luck with the Fire and ice banner... I'm trying to +10 Ylgr (will do with her siblings too) I have used over 300 orbs, so far only 3 Ylgr, 2 blue pity breakers and 1 green pity breaker the game doesn't even want me to have Surtr! Okay I want to cry scream and run around like crazy. Why? THEY RELEASED HRÍD'S VOICE CLIPS! Many people say he sounds like a nerd xD I love the calm, not deep voice he has! He was serious for most of Book 2 but still showed a caring side towards Fjorm, so I never imagined him with a deep voice like Ike and Ephraim. Datamined is out and the Grand Hero Battle is Gharnaf or whatever his name is from Marth's game. If that didn't hit Hríd fans like me hard then the fact that there also a Bound Hero Battle with Helbindi and Ylgr puts the icing on the cake xD Helbindi is Ylgr's new big brother confirmed. Yeah I don't think I'll go for Surtr either, not too interested about him but I will definitely go for Ylgr since I want a full team of the Nifl siblings. The datamine is just a few hours away and it will reveal who the GHB will be, again, very likely Hríd due to the fire and ice banner and the next banner will most likely be winter based, and GHB's released with banners always have a connection with the ones they are released with or the one after. Alright who's idea was it to give a little girl knives?! xD But my prediction of it being a Heroes OC's banner was correct! People are probably thinking me of all people would be upset at IS not putting Hríd on this banner but I'm actually not! Why? Because I knew Ylgr was not going to be a legendary hero like her sister's and most likely her brother. So this now leaves only 2 book 1 OC's and just 1 book 2 OC. With the release of all of the other book 2 characters I think this guarantees Hríd is going to be summonable in the next few weeks, or he is the Grand Hero Battle we are getting tomorrow. At least we can also reunite Helbindi and Ylgr. I'm interested on what Surtr's dialogue is like. Also we have a forging bonds coming up, I wonder who will be in it? We also are definitely getting book 3 next month from the little teaser. Any predictions? I think Alfonse or King Gustav or the queen will die, which explains Sharena's face. Roy may end up being the remaining Fire or Earth element Legendary Hero, I don't really see him being one of the 2 remaining water element heroes since I think that will be Corrin and Hríd and Ylgr will be the remaining Wind element hero. But hey did anyone expect Tiki? There's over 300 heroes so I may be wrong. Yeah I do like Fates but it's getting too repetitive... there's still quite a few main characters without seasonal alts yet (*cough*RenaisTwins*cough*) But I guess now is to wait for Winter season unless I'm forgetting another holiday? It will be interesting to see who they do for Christmas... Santa Ephraim anyone? So the Halloween seasonal banner trailer was released. I have mixed feelings, at least we have a variety of games in this banner unlike last year when we had Awakening and Fates only. This time we have Kagero and Niles from Fates (1 Nohr 1 Hoshido) Mia from Path of Radiance and Radiant Dawn...? And finally Myrrh from The Sacred Stones! Glad we finally got another Sacred Stones seasonal alt, if I'm correct I think we have so far only had a seasonal alt of Tana and Innes...? I was hoping for Eirika but oh well. Probably will only go for Myrrh in this banner and save up for this month's Legendary Hero. Took over 300 Orbs until I finally got Helbindi however I have used less then 50 Orbs on the performing arts banner and already got 5 star focus Inigo and Olivia! Got very lucky with the legendary hero banner too! Got my 2 main targets within 100 orbs!